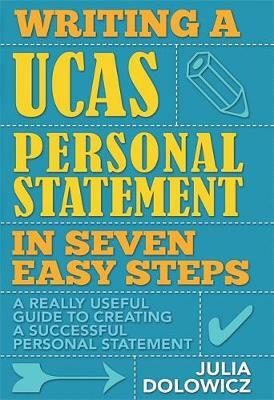 This friendly and accessible workbook takes you through a series of activities that will help you to gather information about your self and condense it into the format required to complete your UCAS personal statement for university. You will use a seven step process that will build your confidence and help you create a compelling personal statement. Reading the book is like being in a coaching session with the author; the tone is light and supportive, and you will be carried along through specific exercises that culminate in the completion of a really effective Personal Statement. Collect it - identify your positive traits, skills, abilities and accomplishments and feel confident about promoting yourself on paper. Expand it - create a 'degree specification profile' to see what the departments are looking for with respect to the courses that interest you. Prove it - evidence of your skills by listing examples from your life,inside and outside education. Think about what you are offering in terms of strengths and what needs further development. Draft it - note down your findings so far and start thinking about how to structure them. Build it - begin building the structure of your statement and formulate your sentences. Review it - read hints about structure, spelling, grammar, punctuation and formatting, plus guidance on receiving feedback. Submit it - a last chance for reflection, re-jigging, and refining; and for reassurance before you submit your statement! Contents: Acknowledgements; Preface; Foreword by Dr Pollie Bromilow; Introduction; Part One: Your Personal Statement in Seven Easy Steps; Step One: Collect it; Step Two: Expand it; Step Three: Prove it; Step Four: Draft it; Step Five: Build it; Step Six: Review it; Step Seven: Submit it; Part Two: Frequently Asked Questions and Preparing for Interview; Frequently Asked Questions; Preparing for your Interview; Glossary; Dates for your diary; Recommended Reading and Viewing; Index. This is a must buy! Its worth every penny and great value for money. It gave me simple and easy tasks in order to write what was needed and more. With thanks to this book I got into the uni of my choice!